Once the first compensation claim arrives and the lawyers move in all bets are off. Even Lawwell and his legion of lickspittles can do nothing against the power of the law, they will unturn every stone and the national media will finally wake up. At least they’ve got Dornan (did he pull through?) to keep them informed of court business plus all that Sevco law experience might come in handy. Pretty sure litigation lawyer will be contacting victims imminently. Co-op Bank can expect a big loan application sometime soon. Is it possible to have a class action started in Scotland ? while it would obviously be a great help to the victims and their families its really not about money now. Its also bigger than taking away a few medals and trinkets via titles. Many kids were abused and the enabler really needs to pay. Now were this the BB down the road or the tennis club or the Scout group or the local sewing bee, what do we think would happen? Well a wild guess says they would be closed down and erased from any record book. Remember what we are hearing as disturbing as it is, is infact the tip of the iceberg. We cant allow some millionaire to write a cheque and it all goes away. Fans of other clubs as well as celtic fans are expected to turn up and continue to fund this organisation. Would anyone continue to fund BB down the road or the tennis club or the Scout group or the local sewing bee in these horrendous circumstances. Yes, I'm not a lawyer but I'm sure it can be done. Happy to be corrected if I'm wrong though. Lawell won't have the cash for all the possible claims, it would have to be from Dermots account. while the victims deserve compensation and I hope they get what they deserve. A big rich guy cant be allowed to write a cheque and make this go away. This is a football club funded by the public. The public should not be funding those who enable child abuse. Then if the world has an appetite to take them back we will see. Penn fhilth Glasgow fhilth,Bhrothers in abuse. John McCluskey's testimony was the pivotal moment in the Torbett case, and he testified of Stein's knowledge. 'As soon as Jock heard he went and threw him out the club'....Sean Fallon. 'It was an open secret within the club'... Billy McNeill. They all knew - everyone knew they knew - or were they dastardly proddy bigots telling lies to blacken the name of the jolly craicsters. Has anyone got the newspaper article with McNeill's quote from the court case? Thing is should Celtc face several law suits the bigger impact will be the loss of revenue from sponsors and investors who will knock each other out of the way to get off the rat infested sinking ship. As much as I agree,I doubt very much if there's the will in Scotland to allow that to happen. Pity though. It’s very possible the institution may be shut down if it’s riddled. You would like to think a child abused in Scotland is every bit as shocking as a child abused in the USA. It doesn't seem to be though. The cover up is an absolute outrage - as big a scandal - if not bigger than the Saville BBC scandal to which there is quite a worrying, albeit very thin, line to celtic park. The silence from prominent people in Scotland is beyond belief - this should be debated in the scottish parliament. The silence from celtic is telling, however I expect a statement at some point from them that somehow turns this around into a PR positive for them with a possible sizable donation to children's charities. This should be the catalyst to name and shame and give child abuse the attention it deserves in Scotland because it seems to be the crime that must not be spoken about. As much as I want these Feckers to suffer just as much as the lives they destroyed I think the cult and the national rabble will protect them, just like helmet heid moved fast to remove church and sports from the list of organisations that would be investigated by their version of the inquiry that was/is taken place in England. This would be great news to see Celtic being sued for this. I seriously doubt there will be any lasting repercussions on this rancid organisation. They are far too well protected. It's sad what this country's become. I'll bet there are thousands of genuine celtc fans squirming uncomfortably at the way their club is dealing with it. Effectively washing their hands and turning their backs on the victims. If Rangers were to behave in such a way - I question whether I would ever feel the same about my club. I certainly would not be renewing my ST. There is absolutely no dignity in the way they've dealt with it over the last 30 years. No empathy and no remorse. It's almost like a mass psychosis. Celtic should be sued but as per the Boston cases - they will make a payment to the victims and get them to sign confidentiality clauses, this seems to be how they deal with children being abused whilst in the care of club coaches. The compliant media and tame mp's will make sure this never tarnishes Celtic in any way. I'm sure illphill and the Hagg are at this moment trying to concoct someway of making it sound like it is a sectarian witch hunt against Celtic. Have they not called in the 60m marker a few months ago?? First case confirmed to be going ahead in May against Celtic. Reported by Stephen McGowan in today's papers. Could be up ton six so far prepping to sue. Let justice take its course. They have nowhere to run now. Obviously there was a paedo ring operating out of Celtic Park, however when you see links between that Barry Bennell guy, pictures of Jimmy Saville with Jock Stein etc and potential government paeodphiles as well...it honestly could go all the way to the top - hence the decades long cover up. Wonder if BDO will insist on a Contingent Liability in the accounts for Compensation in respect of failure to protect children. 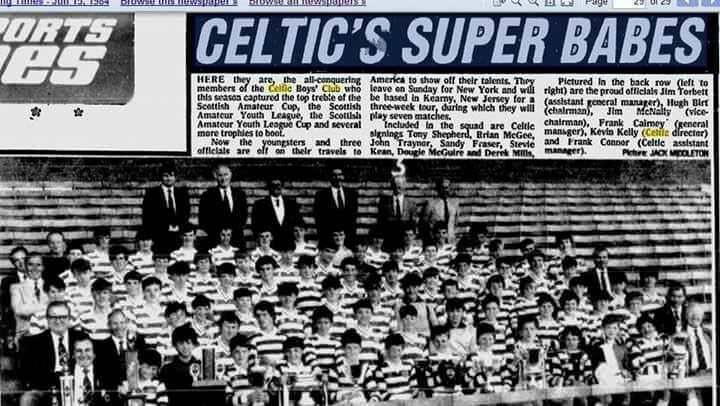 It was agreed, by Brady, the boy and his parents and the then Celtic board, that the police would not be informed. The young player was assured that the alleged incident would have no effect on his future career at the club. However, signed statements were taken by Celtic's lawyers from the four adults who had been on the New Jersey trip. All were sworn to silence. For no connection CFC seemed to have a lot of influence. Section 20 of the Civil Litigation (Expenses and Group Proceedings) (Scotland) Act 2018 allows "Group Proceedings" to be raised at the Court of Session. This is very new legislation and I have no idea how this would work in practice, or how it compared to a "class action" in the USA. Very often in the States, the only winners are the lawyers. They deserve to be hammered for this. Perhaps there is good in then there hills for US attorney's to make more! There was a cover up on American soil. Jock knew, now everybody knows. I still can't get my head round the leniancy of the sentence, 6 years. Its nothing compared to the lives he's ruined. Bumping for @Arminius and @Grigo Yossarian for info. We've got no idea how high this goes. That was the fat taig who sued them as he fell walking put the ground or in the corridors of ye ground and shattered his knee if IIRC. Yep and I think the Irish man will sell his shares and bail out he has enough corruption around him without any more. Some separate entities eh ? What did the paedo's at Celtic get? Community service and 4 years? (out in 2 for good behaviour). How many of the adults in that photo are still alive? Where is Kevin Kelly now? This isn't a matter of whether or not Dermot Desmond can dig deep enough, this is indeed a case of whether Scotland as a nation has enough depth of moral feeling for real social justice unsullied by shallow political and tribal selfishness. Yep and I think the Irish man will sell his shareney wrong s and bail out he has enough corruption around him without any more. I do remember a few years ago he was found giulty, in the French court of all kinds of money dealings in a Latvian bank he was a third part owner off, he was fined millions, don't know how that went with him?